Besides their booked duties, Irish Rail diesels step in to cover RPSI Christmas railtours after two steam failures. Every year in the period before Christmas, the Railway Preservation Society of Ireland (RPSI), in association with Northern Ireland Railways and Irish Rail, organises a series of ‘Santa Specials’ in the Belfast and Dublin areas, with both series this year being fully booked by mid-November. 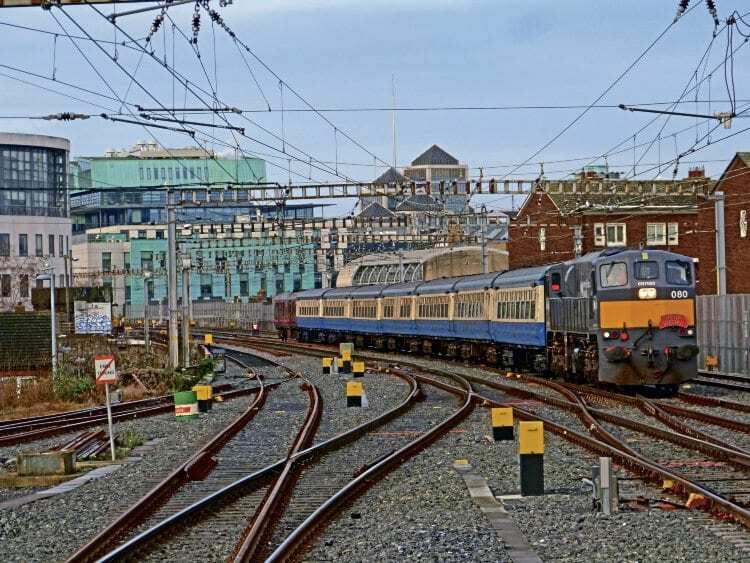 The Belfast-based programme was planned to be worked by steam, but the Dublin trains – which ran from Pearse station to Greystones and return – featured some diesel trips. These were the 16.40 ex-Pearse on Saturdays December 3, 10 and 17, and a 17.10 additional ex-Pearse on Sunday, December 18 – the latter train added because of demand prior to the programme commencing. The use of diesel power for part of the Dublin programme was, as in previous years, because of issues with steam locomotive traincrew hours. The Inchicore-based consist of seven preserved Cravens coaches and ‘BR’ van No. 3173 was worked empty stock from there to Connolly each Friday evening, and returned on the Sunday evening by the GM locomotive assigned for the weekend Santa duties.